This post is a feature I’ve been wanting to write for some time. I discovered Murakami and his work about a year and a half ago, via the Selected Shorts podcast, where I first heard his short story “The Iceman” read aloud. Shortly after, I plunged headfirst into the bizarre, engrossing world of 1Q84 and haven’t been the same since. Prevalent motifs throughout Murakami’s extensive body of work include cats, dreams and hallucinations, magical realism, androgyny, ears, aliens, fate, and coincidences (that are usually so much more than simple coincidences). Most if not all of these motifs can be seen in his longest work, 1Q84. The title clearly pays homage to Orwell’s Nineteen Eighty-Four, but the story is not the same. As much as I’d like to write a review on 1Q84, that’s another post for another day. We’re here to talk about some of Murakami’s other work. He is considered one of the foremost authorities on modern literary fiction, having published several different short stories, novels, and nonfiction essays. Some of his most notable works include “The Iceman,” After Dark, The Wind-Up Bird Chronicle, Kafka on the Shore, and Norwegian Wood (the movie adaptation for which is currently on Netflix). His prose is captivating, magical, and sure to win you over from the very first page. If you’ve never read Murakami, check out “The Iceman.” And be sure to let me know what you think about it! 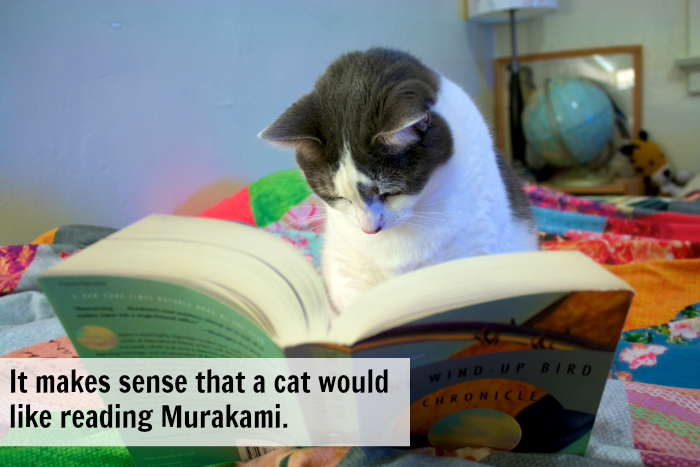 Have you read Murakami? What do you think of him? P.S. Book Review: Flowers in the Attic by V.C. Andrews, Book Review: Oleanders in Alaska by Matt Thompson, Book Review: Adulting by Kelly Williams Brown, and Book Review: Morning Glory by Allison Blanchard.